Take three 6 inch cake pans and spray the inner sides with baking spray. Line the bottoms of each pan with a circular cutout of parchment paper. Preheat the oven to 350 F (190 C). Place softened butter, sugar, and vanilla in the bowl of a stand mixer. Beat on medium high with the whisk attachment until light and fluffy. Scrape sides and bottom of the bowl twice to incorporate all ingredients. In a separate bowl whisk together sifted flour, salt, baking powder, and baking soda. Set aside. Add eggs one at a time into the butter mixture on medium speed. Next spoon in flour mixture, alternating between slowly pouring in almond milk. Once all ingredients are in the stand mixer bowl, mix until just combined. Remove bowl and stir in poppy seeds with a wooden spoon. Divide the batter between the three pans. Place all three pans on the same rack in the oven and bake for 20-15 minutes. Check each cake by sticking a toothpick through the center. If your toothpick comes out clean with a couple moist crumbs, its ready. (check each cake individually). Remove cake pans from the oven and set on a wire rack to cool. Completely cool cakes before removing from pans. Once cooled, flip each pan upside down onto your hand and gently set layers onto a flat tray. Peel the parchment paper from the bottom and set layers face up in the pan. Take serrated knife and trip the tops of each layer, just enough to create a level surface. Grab your cake stand or serving dish and dollup a half dollar size of lavender buttercream onto the center. Place one layer onto cake stand, trimmed side up. Spoon and smear a layer of lavender buttercream across the top. Slightly going over the edges. Add top layer of cake trimmed side down. Cover with lavender buttercream frosting. Using an icing spatula fill in open sides with additional frosting. Then take a bench scraper in one hand, while holding the cake stand in the other. Gently rotate the cake as you scrape the sides with an angled bench scraper. 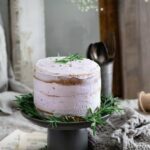 Softly even the top of the cake and garnish with lavender stems or berries.